Explanation: Nominated for most mysterious star in the Milky Way, V838 Monocerotis briefly became one of the brightest stars in our galaxy. Its outburst discovered in January 2002, observations have indicated that V838 Mon somehow transformed itself over a period of months from a small under-luminous star a little hotter than the Sun, to a highly-luminous, cool supergiant star -- defying the conventional understanding of erupting stars and stellar life cycles. In this spectacular image, one of a series recorded last year by the Hubble Space Telescope, the dimmed V838 Mon is surrounded by an "expanding" nebula. 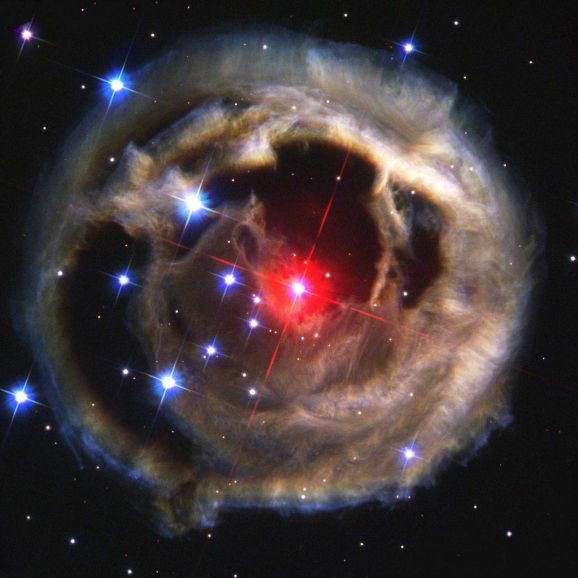 But the nebula is actually a series of light echoes from formerly unseen shells of dust up to light-years in diameter. Previously ejected, the intricate shells progressively reflect light as it reaches them from V838 Mon's outbursts. Astronomers anticipate that light echoes from farther out in the dust envelope will continue to be visible until about 2010. Some estimates now place V838 Mon about 20,000 light-years from planet Earth.